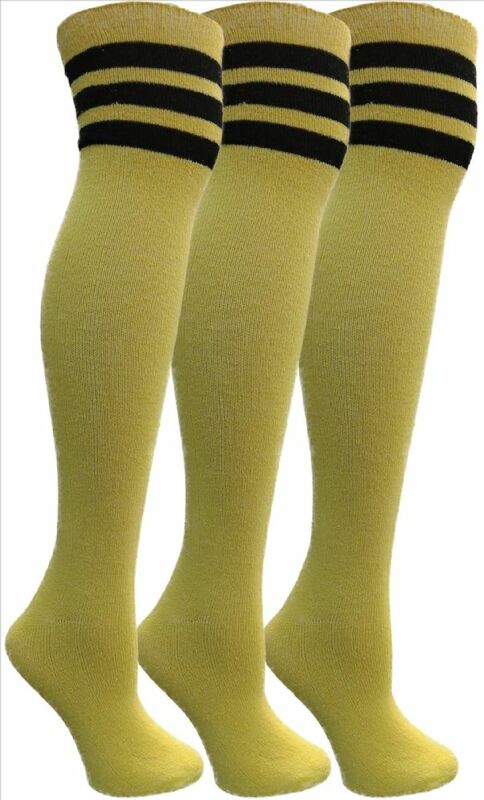 Yacht&Smith Womens Over the Knee Socks, 3 Pairs Premium Soft, Cotton Colorful Patterned (3 Pairs Yellow) at low wholesale prices. Socksinbulk.com offers Womens Knee Highs at bulk discounted prices. The over the knee high sock is a staple in every chic woman’s wardrobe. Being stylish and cute for all occasions and all season wear. Whether wearing it for a party, to go shopping, or to spend time with family & friends, pair these socks with a skirt or shorts for a colorful and fun look. Choose from colorful assorted designs and patterns to match any outfit or mood. SATISFACTION GUARANTEED: Buy with confidence and get a 30-DAY MONEY BACK GUARANTEE. If you are not satisfied with our socks, please contact us and we will respond within 24 hours. Your satisfaction is our top priority. Sock size 9-11 will fit women’s shoe sizes 5-10 (US). Made with 80% cotton and 20% spandex. Pair these with your favorite skirt or shorts for a fun and cute look. Or wear these in the winter time to add an additional layer providing you with warmth and comfort. Show off your fun-filled personality and lifestyle with these fun socks. Can be worn with sneakers, boots, or shoes and it will still be just as stylish. Over the knee high socks are a must have in every woman’s wardrobe. Sock size 9-11 will fit women’s shoe sizes 5-10 (US). One size fits most women.